The latexless jackfruit is a Malaysian native fruit tree. It has been promoted for propagation and planting here in the Philippines in aid of Mr. Bernie Dizon, one of the expert pomologist and agriculturist known for his knowhow in the double and multiple rootstock grafted planting material technology which has brought a significant increase in the yield and harvest of fruit trees in the Philippines today. With demo farms around the countryside in provinces like Davao, Laguna, Visayas provinces and Manila plant nursery, Mr. Dizon makes his planting technology available for all to harness and use. He sells all sorts of exotic fruit trees at the Wildlife Conservation Park which he had a place dedicated to plants, particularly exotic fruit trees like Davao Pomelo, Latex less jackfruit, Longkong Lanzones of Thailand (which happend to be one of the most expensive fruits in the world today), Chok Anan mango, different variegated varieties of fruits like chico, mangosteen, macopa, rambutan, mandarin, durian, calamansi, guava, anonas, abiu and more. Want to Buy Latexless Jackfruit Planting Materials? So where can you buy latex less jackfruit planting materials in double rootstock or multiple rootstock in the Philippines? There are a few sellers of this Malaysian variety here in the country but if you really wanted to have a taste of the fruit, it is best to search for information on how to grow or plant and propagate the fruit tree from a certified agriculturist. There are a few who is one of those who started to make available this variety here in the Philippines for planting. He had several demo farms where you can reach him including his place at the Wildlife Conservation Park in Quezon Ave, Quezon City. For those who want to buy seedling planting materials, we have it for sale as per actual picture below. Price is only Php 150.00 single rootstock only. 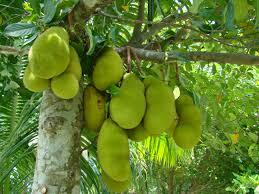 Above is an actual fruit of the latex less jackfruit in the Philippines. One of the best advantage as well all know in buying the latex less jackfruit (both the tree and the fruit) is all common sense - you get to eat with less the messy latex juice when you open up the fruit. But apart from this specific and quite obvious reason, there are more that you might be interested in knowing. One of them is the prolific advantage in yield and harvest plus if you get the double or multiple rootstock planting materials which as grafter, you get to have fruits to harvest one half the time it will take or maybe even earlier compared to when you plant it in seedlings or single rootstock. Make sure that if there is available multiple rootstock to get it at that planting medium type.